My husband and I went garage sale shopping last Saturday. I had to go get blood drawn, and we were up and out earlier than I needed to be there. I have been trying to find a tricycle for my little kids, so we went down and copied addresses and hit six or seven sales. We made out pretty good. I found a folding toddler seat with a tray just exactly like the one I already have, some Disney movies for the kids to enjoy, a great Taste of Home Cookbook, and a pressure canner. I have the exact same model of pressure canner, except mine is a 22 quart, and this one is an 8 quart. That means I can use the new one to pressure can smaller batches of food in less time, because it doesn't have to build up pressure to fill the 22 quart space. I was SO excited to find it for three dollars. It is in like new condition, and the rubber seal was still good, to my surprise. I haven't used it for canning yet, but I tried it out to make supper tonight. 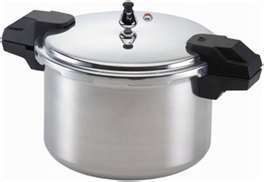 Pressure cooking is an excellent method for tenderizing and getting slow cooking food done quickly. It is a wonderful way to cook dried beans, rice, stews, and fricassee type meals. I had a little bit of trepidation about pressure cooking. When I was growing up, my Mom used her pressure cooker often. My father was a hunter, and fisherman, so we had lots of wild game to eat. Instead of chicken, we ate sage grouse. We had elk steak and roast instead of beef. My mother was not so creative in her cooking style, so often she would pressure cook meat like elk roast for meals. I don't think she browned the food before pressure cooking it, or used a lot of seasoning, and it always was bland, grey and tasteless. However, that chchchchch sound was a part of my daily experience as a kid, and I decided I'd try out my "new" cooker for supper tonight, mostly just for old time's sake. I had some chicken leg quarters thawed out for dinner, and some pasilla peppers that needed used up. I decided to make Cacciatore, or Hunter's Stew. This is a meal that was put on the back burner before the hunters headed out to the field. It is served over a starch like pasta or rice, and is a delicious recipe, especially with the dark meat leg pieces. It is a slow cooker favorite of mine, but you can make it in the pressure cooker in less than an hour, prep included. Season leg quarters and brown in the pressure cooker with the lid removed. After the chicken is browned well on both sides, remove the chicken to a plate, and add the vegetables. Saute until the onions are starting to soften. Add the garlic and spices, and deglaze the pan with the wine, scraping up the browned bits with a spatula. Add the tomatoes, and season to taste. Nestle the chicken back in the pan and put on the lid. Cook on high heat with the weighted gauge on 10 pounds. When the gauge starts to chitter, reduce the heat slightly and cook for 25 minutes. This will take a little practice to know where to turn it to so that it still chitters, but doesn't get so hot it blows off too much steam. I have pressure canned for years, so I know exactly where to set it to maintain that happy medium. Turn off the heat, and let the cooker stand for 5 minutes on the burner. Carefully move the closed cooker with the weighted gauge still on to the sink, and then run cold water over it. Remove the weighted gauge. When no more steam escapes the valve, it is safe to open the cooker. You will be amazed how deep red the sauce is, as the tomato's natural sugars have caramelized. It is called the Maillard Reaction, in technical terms, and it spells big flavor. The chicken comes out moist and fall off the bone tender in this short amount of time. The wine, tomato, herb and garlic flavors have permeated the meat because of the pressure applied. Honestly, It took less than an hour, even with chopping vegetables and browning the chicken included. I will never cook Cacciatore in my slow cooker again!